"Freebird" redirects here. For other uses, see Freebird (disambiguation). For the Beatles song, see Free as a Bird. For the Germanic legal concept, see Vogelfrei. "Free Bird", or "Freebird", is a power ballad performed by American rock band Lynyrd Skynyrd. The song was first featured on the band's debut album in 1973 and has been included on subsequent albums, including the unfaded-ending version of the original recording (featured on Skynyrd's Innyrds). Studio One, Doraville, Georgia, U.S.
Humorously, the song has been referred to as the official "Modern-day Confederate Theme Song" or "Modern-day Confederate Anthem". Released as a single in November 1974, "Free Bird" entered the Billboard Hot 100 on November 23 at No. 87 and became the band's second Top 40 hit in early 1975, peaking at No. 19 on January 25. A live version of the song reentered the charts in late 1976, eventually peaking at No. 38 in January 1977. "Free Bird" also achieved the No. 3 spot on Guitar World's 100 Greatest Guitar Solos. It is considered to be Lynyrd Skynyrd's signature song, is used as a finale during their live performances, and is their longest song, often going well over 14 minutes when played live. According to guitarist Gary Rossington, for two years after Allen Collins wrote the initial chords, vocalist Ronnie Van Zant insisted that there were too many for him to create a melody in the belief that the melody needed to change alongside the chords. After Collins played the unused sequence at rehearsal one day, Van Zant asked him to repeat it, then wrote out the melody and lyrics in three or four minutes. The guitar solos that finish the song were added originally to give Van Zant a chance to rest, as the band was playing several sets per night at clubs at the time. Soon afterward, the band learned piano-playing roadie Billy Powell had written an introduction to the song; upon hearing it, they included it as the finishing touch and had him formally join as their keyboardist. Allen Collins's girlfriend, Kathy, whom he later married, asked him, "If I leave here tomorrow, would you still remember me?" Collins noted the question and it eventually became the opening line of "Free Bird". The song is dedicated to the memory of Duane Allman by the band in their live shows. During their 1975 performance on The Old Grey Whistle Test, Van Zant dedicated the song to both Allman and Berry Oakley, commenting, "they're both free birds". 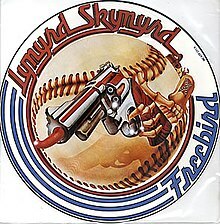 "Free Bird" is included in The Rock and Roll Hall of Fame's 500 Songs that Shaped Rock and Roll and at number 193 in Rolling Stone's 500 Greatest Songs of All Time. In 2009, it was named the 26th best hard rock song of all time by VH1. The song—half ballad, half up-tempo guitar solo—quickly became a staple for Lynyrd Skynyrd at their live performances. Many recognize its 5:12 triple guitar solo section that closes it out. It often turned into an extended jam session at concerts. The band consistently played it as the last song of their shows, as it was their biggest crowd pleaser. The song was a huge hit for Lynyrd Skynyrd and it remains a fan favorite to this day. It is also a classic rock radio staple. It has become something of a humorous tradition for audience members at concerts to shout "Free Bird!" or "Play Free Bird!" as a request to hear the song, regardless of the performer or style of music. For example, during the Nirvana 1993 MTV Unplugged in New York show, a shout-out for "Free Bird!" eventually resulted in a lyrically slurred, if short, rendition of "Sweet Home Alabama". The phenomenon began earlier in the 1970s with The Allman Brothers Band's "Whipping Post" and Deep Purple's "Smoke on the Water" but then took off with "Free Bird" by 1979. On Skynyrd's first live album, 1976's One More from the Road, Van Zant can be heard asking the crowd, "What song is it you wanna hear?" The calls for "Free Bird" led into a 14-minute rendition of the song. During the beginning of the song he would make the comment about "playing it pretty" (e.g,, "Play it Pretty for Atlanta") Kevin Matthews claimed to have further popularized it in the 1980s from his Chicago-area radio show. In recent tours, since the song returned to their set list, it has become common for the band to again close concerts with it, with photos and film of the former band members being shown on a screen behind them, while lead singer Johnny Van Zant points his microphone to the sky as a tribute. This can be seen on the band's 2003 Vicious Cycle Tour concert video. An all-star band performed the song to conclude the final episode of The Tonight Show with Conan O'Brien. Will Ferrell sang lead vocals and played cowbell, and was backed by Beck, ZZ Top's Billy Gibbons, Ben Harper, and O'Brien himself on guitar, drummer Max Weinberg and the rest of the show's house band. Some commentators found the lyrics especially resonant due to Conan's decision to leave the show rather than allow it to be aired in a later time slot. The song has been featured in several video games, films, and television series, including Soylent Green, Westworld, The Towering Inferno, Logan's Run, The Doors, The Last Boy Scout, Soldier, Blood Diamond, Time Bandits, Spaceballs, Wayne's World, Josie and the Pussycats, Sid and Nancy, This Is Spinal Tap, Airheads, Bill & Ted's Excellent Adventure, Dude, Where's My Car?, Empire Records, High Fidelity, Rock Star, The Rocker, The Full Monty, Napoleon Dynamite, Idiocracy, Speed, Broken Arrow, Entrapment, Lethal Weapon 4, Exit Wounds, Mad Max: Fury Road, Guitar Hero II, Forrest Gump, American Pop, House of Cards, The Devil's Rejects, Guitar Hero: Smash Hits, Rock Band 3, ER, Everybody Loves Raymond, Grand Theft Auto: San Andreas, Californication, Free Birds, That '70s Show, Flushed Away, Chicken Little, Elizabethtown, Toy Story 3, The Simpsons, Family Guy, The Goldbergs, and Kingsman: The Secret Service. The song has sold 2,111,000 downloads in the digital era. The addition of Steve Gaines returned Lynyrd Skynyrd to the formula that Ronnie Van Zant felt gave the band its first road to success with a three-person lead guitar sound. Collins' "Free Bird" solo at the end was changed so that the two guitars were complementing and challenging each other throughout that solo. The American dance-pop group Will to Power created a medley of this song and the 1976 Peter Frampton song "Baby, I Love Your Way" in 1988. Titled "Baby, I Love Your Way/Freebird Medley", it spent one week at No. 1 on the Billboard Hot 100 chart. Molly Hatchet covered the song on their 1985 live album Double Trouble Live. It was released as a promo single. It was also covered by Wynonna Judd on the 1994 tribute album Skynyrd Frynds. The song was also covered by Bronx Casket Co. on their 2005 album Hellectric in Goth style. American jam band Phish has performed an a cappella version of the song live, most frequently throughout 1993–94 and 1998. ^ Lynyrd Skynyrd. (Pronounced 'Lĕh-'nérd 'Skin-'nérd). Songs of the South (Universal City), 1973. Hosted at Discogs Archived April 24, 2006, at the Wayback Machine. Retrieved June 9, 2014. ^ Lynyrd Skynyrd. "Free Bird / Searching". MCA Records (Universal City), 1976. Hosted at Discogs Archived April 24, 2006, at the Wayback Machine. Retrieved June 9, 2014. ^ Whitburn, Joel. The Billboard Book of Top 40 Hits, 9th ed., p. 403. Billboard Books (New York), 2010. Retrieved June 9, 2014. ^ Lynyrd Skynyrd. "Free Bird / Sweet Home Alabama / Double Trouble". Leeds Music Ltd. (London), 1976. Hosted at Discogs Archived April 24, 2006, at the Wayback Machine. Retrieved June 9, 2014. ^ Lynyrd Skynyrd. Official Website. "(pronounced leh-nerd skin-nerd) Archived February 27, 2012, at the Wayback Machine". Retrieved June 9, 2014. ^ a b c Fry, Jason. "Rock's Oldest Joke: Yelling 'Freebird!' In a Crowded Theater" in The Wall Street Journal. March 17, 2005. Retrieved June 9, 2014. ^ Erlewine, Stephen Thomas; Erlewine, Stephen Thomas (May 15, 2018). "Lynyrd Skynyrd: Inside the Band's Complicated History With the South". ^ "Billboard Charts Archive, November 23, 1974". Billboard. Retrieved July 16, 2018. ^ "Lynyrd Skynyrd Chart History". Billboard. Retrieved July 16, 2018. ^ "Billboard Charts Archive, December 4, 1976". Billboard. Retrieved July 16, 2018. ^ "100 Greatest Guitar Solos: 3) "Free Bird" (Allen Collins, Gary Rossington)". Guitar World. October 14, 2008. Retrieved March 7, 2012. ^ "Lynyrd Skynyrd Biography". Rolling Stone. Retrieved November 7, 2014. ^ "Free Bird by Lynyrd Skynyrd Songfacts". Songfacts.com. Retrieved March 7, 2012. ^ Paul, Alan (March 4, 2009). "Prime Cuts: Lynyrd Skynyrd". Guitar World. Archived from the original on May 15, 2013. Retrieved September 9, 2013. ^ "Lynyrd Skynyrd-Free Bird Live Old Grey Whistle Test 1975". YouTube. ^ "spreadit.org music". Archived from the original on February 12, 2009. Retrieved February 7, 2009. ^ Daniel Kreps (January 23, 2010). "Conan O'Brien Recruits Will Ferrell, Beck for Final Episode Free Bird | Music News". Rolling Stone. Retrieved July 14, 2014. ^ "Conan Says Goodbye with Will Ferrell & Freebird from TubularGoldmine". Funnyordie.com. January 23, 2010. Retrieved July 14, 2014. ^ "Lynyrd Skynyrd's 'Free Bird' a fitting end to Conan O'Brien's run". members.jacksonville.com. Retrieved July 14, 2014. ^ "Kingsman: The Secret Service soundtracks". Internet Movie Database. Retrieved May 23, 2015. ^ "Kingsman: The Secret Service (2015)". Soundtrack.Net. Retrieved May 23, 2015. ^ Grein, Paul (November 27, 2013). "Chart Watch: Eminem Returns to #1, Gaga Sinks to #8". Yahoo Music. Retrieved November 27, 2013. ^ "Item Display - RPM - Library and Archives Canada". Collectionscanada.gc.ca. January 25, 1975. Retrieved March 8, 2019. ^ "Item Display - RPM - Library and Archives Canada". Collectionscanada.gc.ca. January 15, 1977. Retrieved March 8, 2019. ^ "The Irish Charts – Search Results – Free Bird". Irish Singles Chart. Retrieved March 8, 2019. ^ "Molly Hatchet – Freebird". discogs. Retrieved November 1, 2014. ^ "Free Bird Every Time Played". Phish.net. Retrieved June 3, 2016.